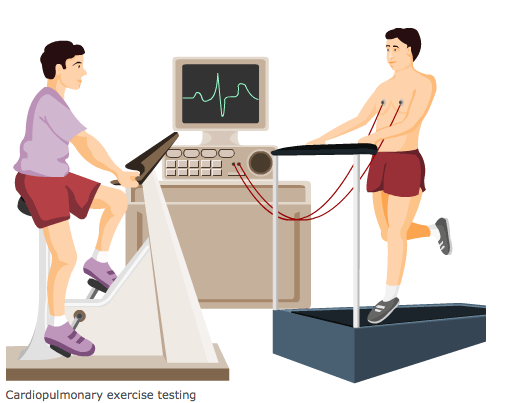 Peak oxygen uptake (VO2peak) via cardiopulmonary exercise testing is considered the gold standard for testing aerobic capacity in healthy participants and people with various medical conditions. The reliability and responsiveness of cardiopulmonary exercise testing outcomes in persons with MS (PwMS) have not been extensively studied. (1) to investigate the reliability of cardiopulmonary exercise parameters in PwMS; (2) to determine the responsiveness, in terms of the smallest detectable change (SDC), for each parameter. Two repeated measurements of cardiopulmonary exercise outcomes were obtained, with a median time interval of 16 days. Thirty-two PwMS suffering from subjective fatigue performed cardiopulmonary exercise tests on a cycle ergometer, to voluntary exhaustion. We calculated the reliability, in terms of the intra-class correlation coefficient (ICC [2,k]; absolute agreement), and the measurement error, in terms of standard error of measurement (SEM) and SDC at individual (SDCindividual) and group level (SDCgroup). The ICC for VO2peak was 0.951, with an SEM of 0.131 L∙min−1 and an SDCindividual of 0.364 L∙min−1. When corrected for bodyweight, the ICC of VO2peak was 0.933, with an SEM of 1.7 mL∙kg−1∙min−1 and in an SDCindividual of 4.6 mL∙kg−1∙min−1. Generalization of our study results is restricted to fatigued PwMS with a low to mild level of disability. At individual level, cardiopulmonary exercise testing can be used reliably to assess physical fitness in terms of VO2peak, but less so to determine significant changes. At group level, VO2peak can be reliably used to determine physical fitness status and establish change over time.